WILLIAMSTOWN, Ky. (AP) -- Two billboard companies have refused to display an advertisement by a group protesting the Ark Encounter amusement park in Kentucky. The Ark Encounter, a 510-foot wooden ship as described in the Old Testament, is under construction and set to open July 7. It's a product of Answers in Genesis, which also owns the Creation Museum. The words on the sign near northbound I-75 and Fifth Street were superimposed over an image of an Ark under construction in the background. 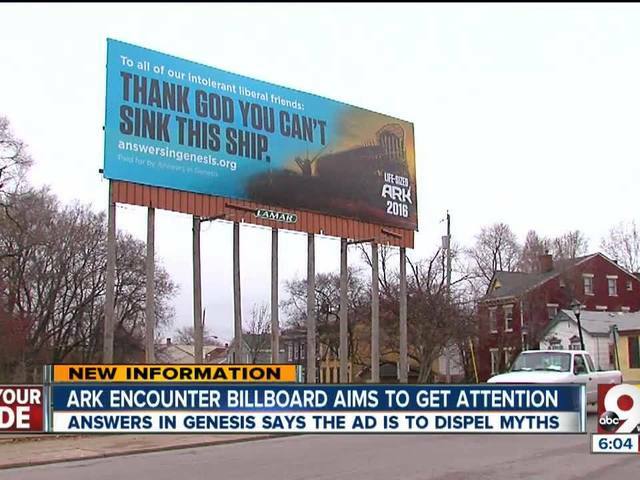 “We wanted a billboard that would catch the eyes and ears of the media as well as the general public to go to our website,” said Mark Looy, chief communications officer for Answers in Genesis told WCPO in 2014.